Since our first issue back in 2013, we’ve been fortunate enough to speak with and photograph some of the most gifted actors working today. On August 24th, a blazingly hot Californian Thursday, with heat rippling off the Hollywood tarmac, we spoke with and photographed the most gifted of them all. In 2004, Cate Blanchett won the Academy Award for Best Supporting Actress for her role portraying Katharine Hepburn in Scorsese’s The Aviator. It’s the only time an actor has ever won an Oscar for playing another Oscar-winning actor. 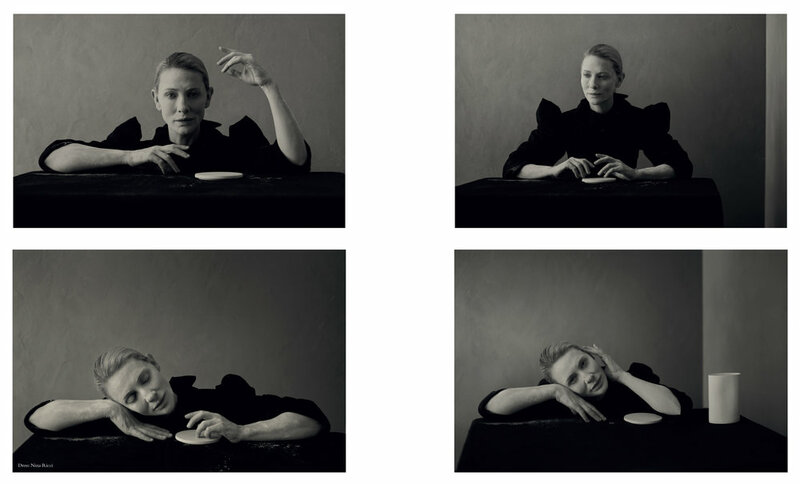 Blanchett seemed to so effortlessly channel Hepburn’s infamous lilting mid-Atlantic grandeur with an unmatchable alchemy of confidence and vulnerability. These two qualities have coloured so much of Blanchett’s best work, and let’s face it, there’s not much (if anything) that has missed the mark. It was 1998’s battle of the costume dramas that saw Blanchett give a simmering, claustrophobic portrait of Elizabeth I at the same time as Gwyneth Paltrow’s (brilliant, but lighter) turn in Shakespeare in Love. Absent a statue, Elizabeth was a harbinger for things to come. A chameleon-like ability to truly inhabit any role with unwavering conviction and honesty soon began to set Blanchett apart. Perhaps only with Meryl Streep does the acting fall away to such a disarming degree that the most recognisable actors in Hollywood simply become vessels for the character on screen. In the years that followed Elizabeth, roles followed in Anthony Minghella’s The Talented Mr Ripley; Peter Jackson’s The Lord of the Rings trilogy; Iñárritu’s Babel; Todd Haynes’ I’m Not There (inwhichBlanchettplaysBobDylan);Notes on a Scandal, Veronica Guerin and on and on. Whether or not the pinnacles of Blanchett’s career performances line up as neatly with the acclaim she received for them is up-for- debate.What isn’t, however, is that the Blanche DuBois inspired turn in Woody Allen’s Blue Jasmine was an acting masterclass, slipping into the depths of self-deceit, delusion and eventually mental breakdown. On the heels of the Best Actress Oscar for Blue Jasmine, Blanchett’s Best Actress Oscar nomination for 2015’s performance as Carol is perhaps the most heartbreaking example of an acting masterclass. Oozing with Todd Haynes’ Kodachromatic melancholy, Blanchett’s Carol is at once masterfully subtle and destructively, beautifully sad. It’s a performance that even the late, great, cantankerous Hepburn would surely have marvelled at. The coming months and years will see Blanchett tread fresh and, to some degree, unfamiliar ground into the world of Stan Lee’s Marvel franchise in Thor: Ragnarok; a series of striking monologues in Julian Rosefeldt’s art-piece, Manifesto; and even The Jungle Book. 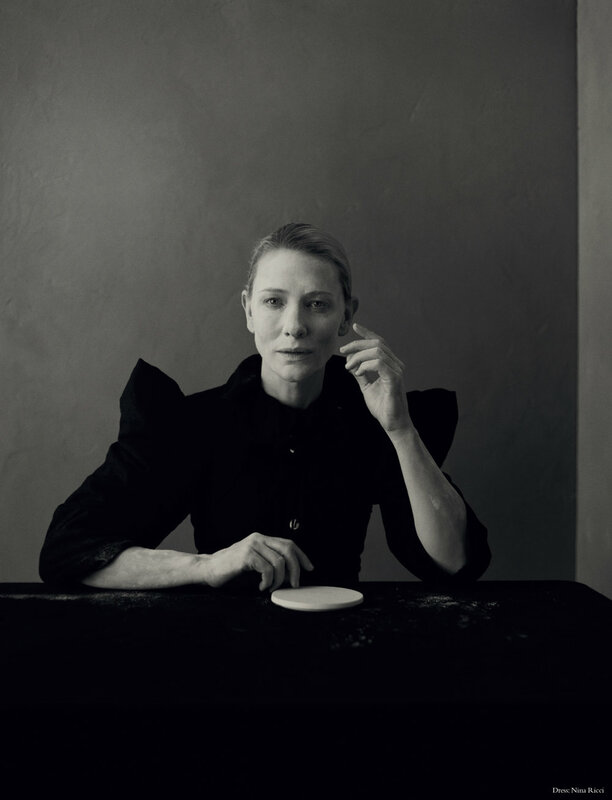 So It Goes editors JamesWright and Lewis Carpenter sit down with Cate to discuss what has been and what’s to come. So It Goes: Hi Cate, where do we find you find you today? Cate Blanchett: Lake Como, Cernobbio. SIG: How many hours of sleep did you get last night? CB: I’ve slept six hours out of the last thirty-six. SIG: What’s the first thing you did this morning? CB: Open the doors to the balcony and breathe in the jasmine and cinnamon. SIG: What represents happiness today, tomorrow and in the future? CB: Happiness today is a new card trick learnt, tomorrow it’s feeding the chickens, in the future... anthropogenic climate change being acknowledged and dealt with. SIG: What is your greatest extravagance? SIG: In a world devoid of attachments, responsibility, schools and film sets, which city or place would you move to tomorrow with your husband and children? CB: I am never. Moving. Again. Ever. SIG:Who is the literary or filmic love of your life? CB: Jimmy Stewart. Chekhov. Today? Rebecca Hall’s performance in Christine. SIG: Which non-fictional character – alive or dead – would you most like to play? CB: I really don’t know how to answer this question. I read books subjectively and without the desire to inhabit them in front of other people. Or do you mean to play in my private life...? SIG: What is the most treasured of all your possessions? CB: A wooden spoon my husband carved for me. SIG: You’re on a desert island and you can take one painting or work of art to look at to break the monotony of the waves lapping on the shore. What would it be? CB: Another difficult question... probably something by Hieronymus Bosch to make me feel like I wasn’t losing my mind and that solitary life on the island was a choice, not a sentence. SIG: You’re on a stamp in Australia, which, in some respects, is the most humbling mark of accomplishment for your work. If you had to nominate someone to be on the next new stamp, presuming printed currency still exists at that point, who would it be? CB: Evelyn Scott (Indigenous Australian social activist and educator). SIG: Do you share our (and the Australian national) passion for cricket? We had to ask. CB: Whilst I appreciate the skill, I prefer a faster game... like table tennis.That said, the Australian women’s cricket team are second to none. SIG: Hollywood is, and always has been, populated by such a rich pool of Australian acting talent.Why do you think the country has developed such a consistently wonderful crop of actors? CB:We are a nation of intensely curious people who, for better or worse, are outward- looking.That – coupled with the fact that in Australia (and let’s face it, this happens globally), participating in artistic pursuits is considered to be elitist, so those who work in the arts feel a constant need to apologise for doing so – means that people often seek work elsewhere. But Australia is a magnetic place, which is why we also all continue to want to make work there. SIG: It seems to be something of an apocryphal, untrue tale that your first role came about because you were in Egypt travelling and were asked to play an American cheerleader as an extra in the Egyptian boxing movie. Given the bizarre ‘origins’ story, can you describe a little your early years at drama school in Sydney and why you enrolled?What kind of ambitions did you have starting out? CB: I (like most actors) had the ambition to work. I was at Melbourne University studying Fine Arts and Economics, left to go travelling, came back, and – in spite of my best intentions – couldn’t stop the urge to make theatre. So I auditioned for the National Institute of Dramatic Art (NIDA) and, much to my surprise, got in. SIG: Theatre as well as film has always played a huge part in your (and obviously your husband’s) life.At our magazine, Hedda Gabler remains one of our favourite plays. How do you feel about the challenges and process of adapting stage work for the screen and vice- versa? Can you imagine a play like Hedda Gabler ever working well in contemporary cinema for instance or are the narrative mechanics just too tricky? CB: Hedda has in fact been played on film many times.The two that spring to mind star Ingrid Bergman and Glenda Jackson... but yes, it’s a difficult one to translate from theatre to film because it is so much about presence. But the real challenge of presenting Hedda Gabler for a contemporary audience (either theatre or film) is tackling the notion of scandal and Hedda’s fear of it.We live in a world now where careers and industries are built around personal scandals and experiencing shame is an anathema to many. SIG: You are part of a very select group of people to have won more than one Oscar: one as lead for Blue Jasmine, one supporting for The Aviator. Could you tell us a little bit about the first and second occasions: how did the occasion make you feel? What are the actual Oscars like? CB:Well... if you mean the physical object... they are magnificent! Shiny, heavy and smooth. The experience of winning one is otherworldly. When a roomful of people you greatly admire stand up for you and not because they need to go to the bathroom... it’s... well... it’s indescribable. But to think you deserve to be there any more than the other nominees would be foolhardy. SIG: Your performance as Katharine Hepburn in The Aviator made you the only actor to win an Oscar for portraying another Oscar- winning actor. An interesting achievement which speaks on some level to your ability to inhabit characters. Not to dive too much into ‘process’ but how detached or engaged are you in the research phase, whether it’s Hepburn, or previous performances of Blanche DuBois, Elizabeth I, Galadriel, Bob Dylan etc? Does it differ in each case or do you have a specific approach? CB: I really believe that the material and the people you’re working with influence – nay, dictate – the approach and the process. I relish the chance to research a period, a person, an atmosphere, but in the end a performance lives or dies based on how connected it is. SIG: You’ve said that from Galadriel to Dylan, the trick is finding the imperfections. CB: I guess I subscribe to a more Eastern sense of attempting perfection: that something is only ‘beautiful’ or ‘perfect’ if it has a flaw. It’s in our flaws that we discover our humanity. And it’s delicious to watch a character hide, cover up, ignore or run from their flaws. SIG: In Thor, your character Hela is the first female supervillain. The role and issue of gender in art and film at the moment is much discussed. How do you see it? Is it a discussion you have with your children, for example, as the received wisdom is that the current younger generation are extremely aware of these kinds of issues? CB: My one hope is that equality of opportunity for women – not only in the film industry but in all industries – is not a fashionable moment, but is finally going to result in lasting, permanent change. The opportunities that radiate from true equality benefit EVERYONE. SIG: Were they familiar with the Marvel world before you took on the role? CB: ARE YOU KIDDING ME? My desire to be in Thor – even as a supernumerary – was driven by the desire to speak the same language as my children. And to work with Taika and Chris, of course! SIG: Hela, the goddess of death, has what looks like a reasonably extensive (not to mention terrifying) hair and make-up routine to go with an equally terrifying headpiece and bodysuit. Tell us about how long that transformation took, morning-to-morning. CB: Darling... it takes longer and longer with every passing year.Thank God for Kay Georgiou and Morag Ross, is all I can say. SIG: You trained with Chris Hemsworth’s trainer Luke Zocchi. What did the routine look like on a good day? And on a bad day? CB: I relished the chance to get fit. The routine, unfortunately, looked exactly the sameonagooddayasitdidonabadday! Fortunately, Luke is hilarious and could do me in twenty minutes (said the actress to the Bishop). SIG: The cast is quite something: Anthony Hopkins as Odin; Idris Elba as Heimdall; Karl Urban as Skurge; and Benedict Cumberbatch playing Dr Stephen Strange; not to mention ex-So It Goes cover star Mark Ruffalo and Tom Hiddleston. How do you feel about the British taking over Hollywood and the Marvel franchises? CB: The Thor comics are written with a tongue-in-cheek old English feel, so perhaps it was inevitable that Marvel went to a master of English language storytelling in Ken [Branagh] to direct the first Thor film. So I don’t know if it’s so much about the British taking over the Marvel franchises – and let’s remember that Taika and Karl are both from New Zealand and Chris and I are from Australia! – but rather Marvel gravitating towards actors and directors who have both heft and a wicked wit. SIG: Without giving away any spoilers, the trailer shows you catching Thor’s hammer – a weapon only he is supposed to be able to hold.Tell us a little about what that says about Hela. CB:Yes,there’ssomanythingsonecan’t say... it’s wonderfully old-fashioned this notion of letting an audience see the film and experience it unfettered by spoilers. BUT – I can tell you that Hela has a very, very strong grip. SIG: Did you have character references when it came to inhabiting Marvel’s first female supervillain? Thor: Ragnarok panel at Comic Con? SIG: I don’t think we’ve been as excited to see a film in recent memory as Manifesto. Written and directed by German artist Julian Rosefeldt, it was originally a multiscreen video installation in which you play thirteen different characters. Was it as formally and narratively challenging as it sounds? How did you first get involved? CB: I first met Julian about seven years ago through a mutual friend. I was intrigued by his work. His reference points and work process were fascinating to me, but it took us a while to develop the right project to work on together.You are right – Manifesto was both formally and narratively challenging, and the most stimulating ten days I have spent in recent memory. I was very proud of what we’d made together when I saw it hanging at The Armoury in New York. He is a deeply interesting human being and a Mensch to boot! SIG: There really are only a handful of actors who have managed to avoid the missteps in terms of film choices, but spanning your body of work, there really aren’t many, if any! How do you feel about today’s ‘one for me, one for the studio’ approach? It seems that the balance of franchise multiplex blockbusters with independent, intelligent human dramas is a very desirable sweet spot? CB: Missteps are inevitable and kind of essential, really. If one is always thinking of the gameplay rather than the adventure, life becomes pretty dull. SIG: Woody Allen, Wes Anderson, David Fincher, Terrence Malick, Spielberg,Ridley Scott, Soderbergh, Todd Haynes, Peter Jackson, Richard Linklater and on and on. It’s just an amazing list of directors you’ve worked with. If you had to alight on one you haven’t yet collaborated with, who would it be and why? CB: I tell you what, if Cindy Sherman had a walk-on in her next film offering, I’d camp out. SIG: We’re interviewing Andrea Arnold today too. That could potentially be an interesting one? CB: Will you put in a good word for me? The atmospheres in Andrea’s films are so particular and unique to each story. The unusual perspectives afforded to an audience and the level of danger and unselfconscious invention is inspiring. SIG: Has one of the above directors ever imparted a particularly profound or impactful piece of advice or guidance that’s stayed with you? CB: “Faster”, “Let’s go again”, and “Let’s keep it within the bounds of plausibility”.